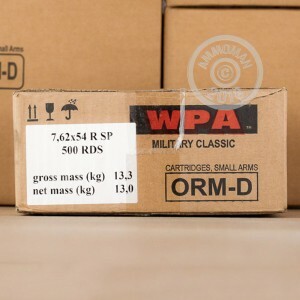 This 7.62x54R ammunition from Wolf delivers dependable hunting performance in Mosin-Nagant and PSL rifles. Each cartridge in this bulk priced case of 500 fires a heavy 203 grain soft point bullet at a muzzle velocity of 2,380 feet per second. The soft point produces high diameter expansion without excessive fragmentation and works well on deer, boar, and other game. 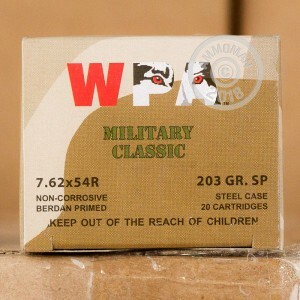 These cartridges are made in Russia and use non-corrosive Berdan primers and steel cases. 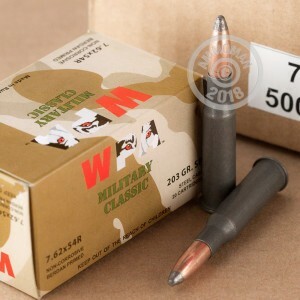 Although they are not reloadable, the steel cases have polymer coatings for reliable cycling and contribute significantly to the lower cost of this ammo. Shop by the case to get the best deals from AmmoMan.com. As a bonus, we include free shipping and handling on all orders over $99.